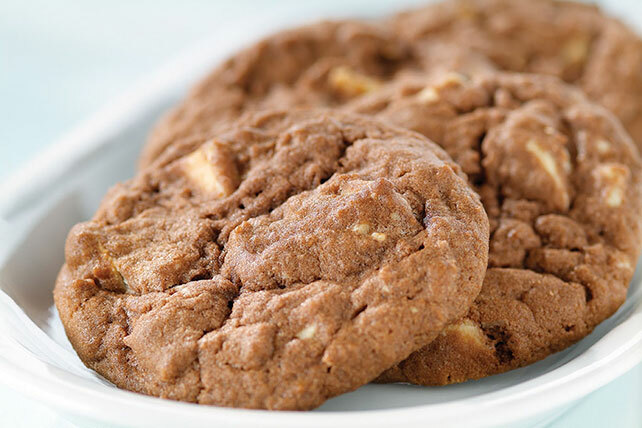 Bring together two dessert favorites when you make a batch of Easy Pudding Cookies. Easy Pudding Cookies have "easy" in the name, so you know you'll have a batch of warm, gooey and moist cookies ready in no time! These cookies are great for both gift-giving and for sharing on a special occasion. Pack cooled cookies in festive resealable food storage bags. Gift tags and bows add the perfect finishing touches to the colorful bags that look great while also locking in freshness. Add 1 cup dried cranberries along with the chocolate. Prepare using other flavor combinations of JELL-O Instant Pudding and stir-ins, such as Pistachio Pudding with dried cherries, Lemon Pudding with chopped PLANTERS Pecans, and Vanilla Pudding with chopped BAKER'S Semi-Sweet Chocolate.